Unwanted email is the bane of my existence – and I suspect I’m not the only one. Even with both server-side spam filters and Outlook’s junk mail feature, both of which do catch many messages per day, I still get way too many email messages that I have to slog through and send directly to the Deleted Items folder. Some folks call this type of email “bacn” – to distinguish it from full-fledged spam and from so-called “ham,” a term sometimes applied to “real” email that you want and welcome like that message from your boss, congratulating you on a job well done. Since I don’t eat pork, I’ll stick with the “gray mail” appellation. But regardless of what you call it, in today’s post I want to talk about this not-quite-spam phenomenon and what you can do to keep it from driving you crazy. Microsoft is credited by many sources with coming up with the term in 2007, when they defined gray mail (sometimes written as one word, graymail) as messages that could reasonably be considered either spam or good. Gray mail, then, is email that falls into a gray area, somewhere between desirable mail and spam. Thus to understand exactly what gray mail is, we have to define spam. Within the tech industry, a common definition of spam is the one that comes from the SpamHaus project (an international non-profit dedicated to anti-spam efforts, including lobbying for anti-spam laws): Email that is both unsolicited and sent in bulk. Gray mail is defined as email that the recipient doesn’t want, but that falls short of the legal or industry definitions of spam. Gray mail is often included in spam statistics. According to Kaspersky Labs, in the third quarter of 2014, as much as 66.9 percent of all email traffic was unwanted mail. 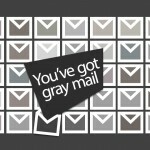 And some estimates say that up to 75 percent of unwanted mail is, in fact, gray mail. I don’t doubt those numbers. Despite all my spam-filtering software, every morning I open Outlook to find at least a dozen messages that I immediately delete without reading. These are generally from companies with whom I’ve done business, but not directly related to any current order or correspondence from me. It also includes various newsletters and such that I’ve signed up for in the past and haven’t gotten around to unsubscribing, surveys, and notifications from rewards programs and other legitimate venues that I don’t really want/need. The dilemma with gray mail is that, unlike with real spam, you can’t just mark it as junk and have your anti-spam software block the sender – because you want to get some of the email that comes from that source. For example, I get messages from Amazon suggesting books I might like or asking me to rate the delivery of a past order. These are unsolicited and go straight to my Deleted folder, but I also get confirmations of my orders and replies to my inquiries about orders or returns or other issues that I initiated, from the same domain – and those are important. Same situation with senders such as American Airlines, Sirius XM, the Wall Street Journal, Trip Advisor and a whole slew of IT-related web sites. No wonder my Deleted Items folder currently has over 6000 messages in it (yes, I keep them for a while, “just in case.” There have been times when I needed to go back and retrieve one of those messages that, in retrospect, was a lighter shade of gray than it seemed at first glance). Okay, I’ve made my point: gray mail can be a problem – especially when it contributes to cluttering up an already overflowing Inbox. Now the bigger question is: what (if anything) can we do about it? The key to reducing the amount of gray mail that you have to deal with is to take a two-pronged approach. One is proactive, with the aim of preventing new gray mail streams from starting. The other is reactive, focused on how to handle gray mail you’re already getting. On the preventative front, the easiest type of gray mail to head off is those coupons, newsletters, sales ads and so forth from establishments where you shop in person but with whom you don’t have a desire to do business online. Much gray mail results from unthinkingly giving our email addresses to retail and other “real world” businesses that ask for them when you check out. When you do this, technically you “opt in” to receive their mail. The solution is simple: either politely decline to provide an email address, or if you think you might occasionally want to peruse their messages but don’t want them flooding your main mailbox, set up a free web mail account and use that address for these types of situations. That way, you can look at it when you want to, rather than having to deal with it as it comes in, when you may be busy with more important mail. When shopping online (or downloading free files, or accessing web sites that ask you to register), if possible be sure to uncheck those boxes that opt in to receiving email – sometimes not just from the site itself but from its partners. If there is no way to opt out, provide your “throwaway” email address, not your primary one. Be careful, too, about advertising your main email address on your own web site, or putting it in your social network profiles. 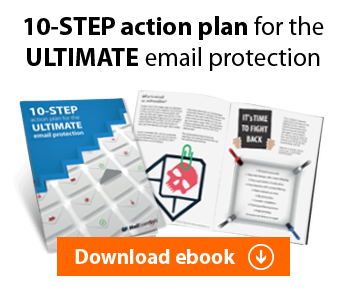 This helps prevent a lot of outright spam, as well as messages from organizations with which you do business with but to whom you didn’t directly give your email address. What about all those gray messages that you’re already getting? That’s a little harder. One solution that takes a bit of time up front to implement but can be well worth it is to filter mail from different organizations to different folders. Almost all mail clients – Outlook, Gmail, Yahoo Mail, etc. – support sorting mail into folders. You can set up rules so that messages from particular senders or with specific key words in the subject lines or body content will go into designated folders. Then, again, you can deal with those messages at your leisure. To make it easier and avoid having to spend the time marking each individual sender as a gray mail sender, many email programs and add-on spam filtering programs also have algorithms to do it for you. They can distinguish between spam and gray mail and they block the former and route the latter to a special folder. Some of these will even automatically assign an expiration date to mail from particular senders and delete the messages after a specified number of days. That’s great for things like coupons or “newsy” messages that are no longer usable or relevant after a certain time. Getting gray mail under control can be even more difficult, in some ways, than getting rid of “real” spam, but making just a few changes in your habits and configurations can help turn the fifty shades of gray mail in your Inbox into a more manageable number.